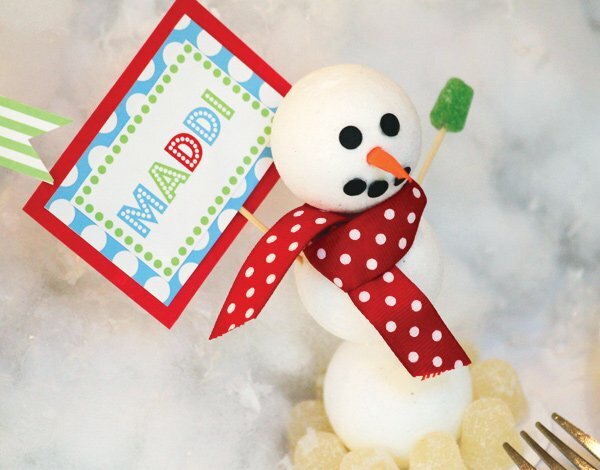 Amanda from Shindig Parties To Go sent in this adorable and super-creative Snowman Children’s Party inspired by her Let it Snow holiday party printables! 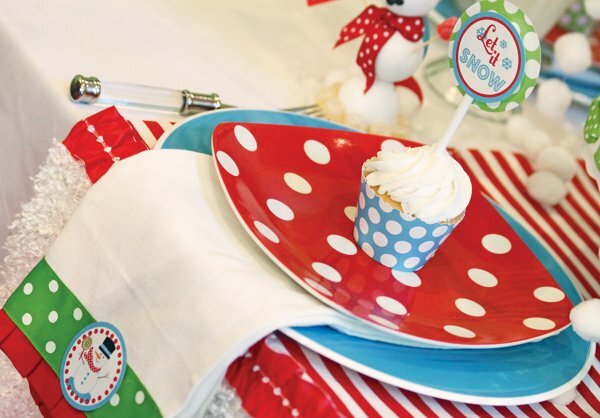 There are so many fun DIY projects to be found here – from marshmallow snowmen pops and snowmen drinking straws to a GIANT snowman centerpiece, 3D snowmen place cards, and more. 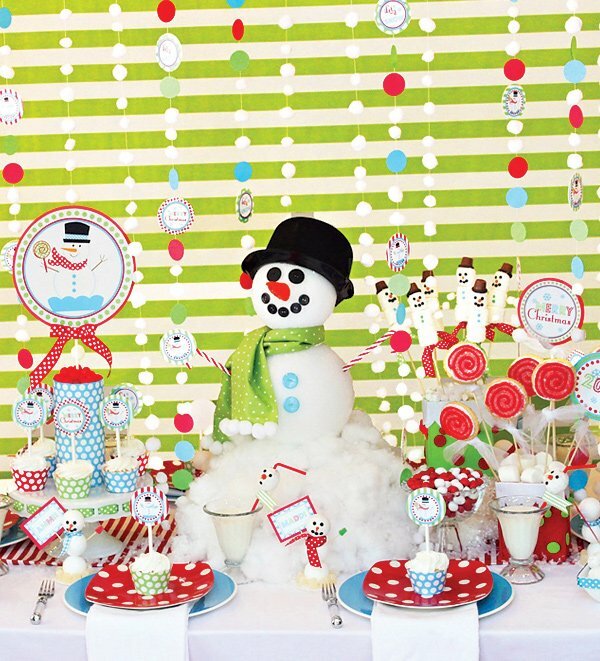 I’m especially LOVING the fabulous pom garlands that are “snowing” down on the table. How fun! 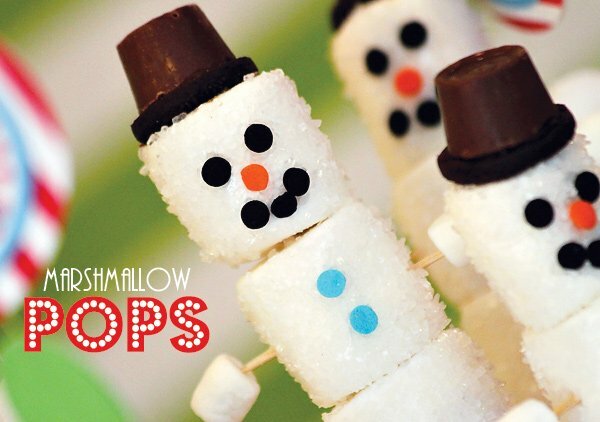 “I made snowmen marshmallow pops (pictured above) from large marshmallows, white sparkling sugar, mini Oreos, fudge icing, Rolos and some confetti sprinkles (Click here for the Tutorial). I displayed them in a cute felt Christmas box filled with mini marshmallows! 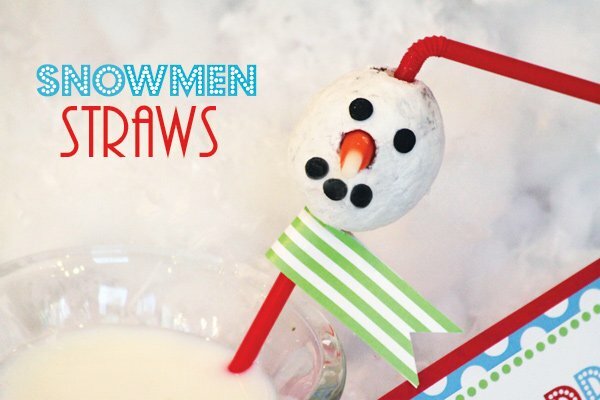 Snowmen straws were made with powdered sugar doughnut holes and black Halloween confetti sprinkles (leftover from Halloween!). The sprinkles were attached with light corn syrup. 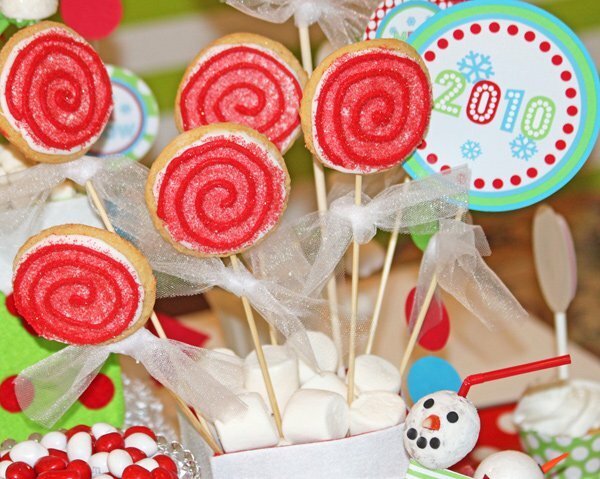 The swirled red sugar “lollipops” were made from sugar cookies baked on sticks, then decorated with red icing melted and red sparkling sugar. The icing was melted in the microwave and poured into a condiment squirt bottle for easier application. 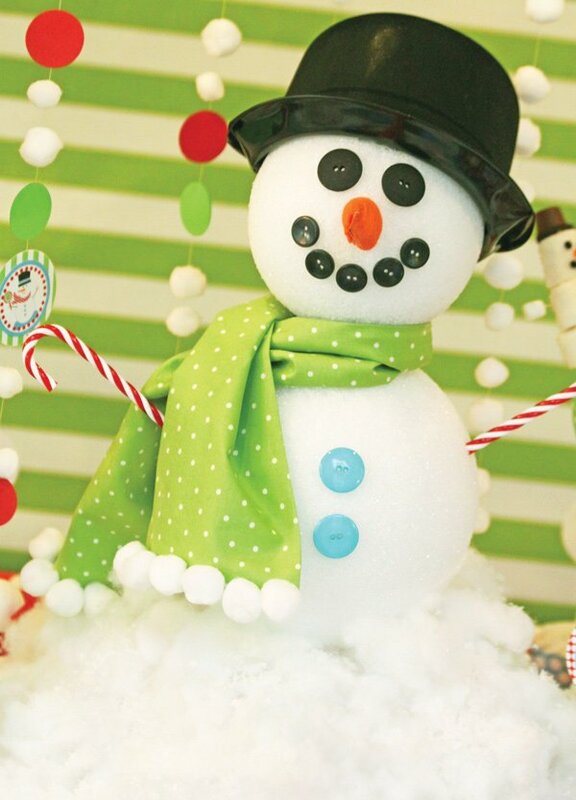 For the big snowman centerpiece, I used 2 sizes of large styrofoam balls, a hat I purchased at Party City, large black buttons, and a nose that I fashioned from orange felt. 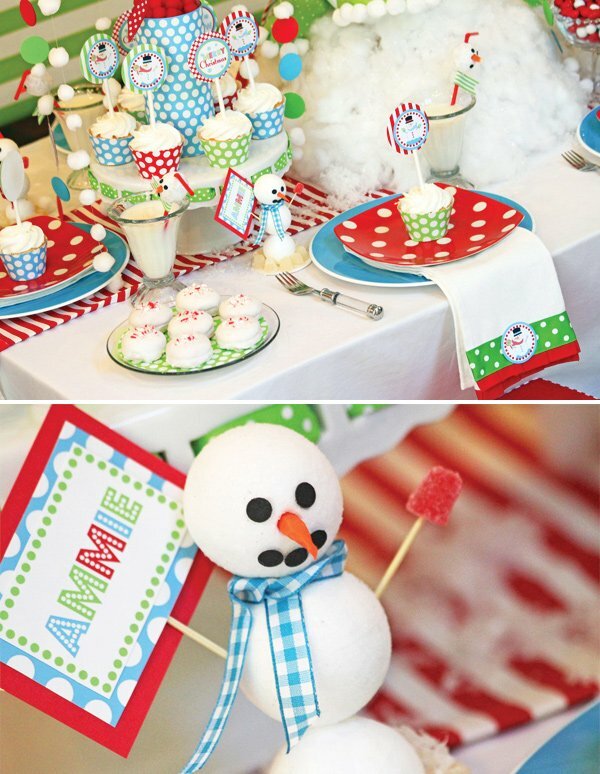 Candy cane ornaments were used for the arms, and and lots of cotton batting surrounded the snowman! 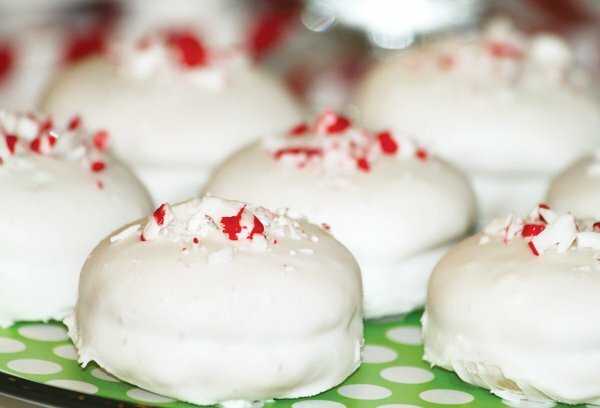 White cookies with crushed peppermint: I made these using Oreo cakesters covered in melted canned white frosting. 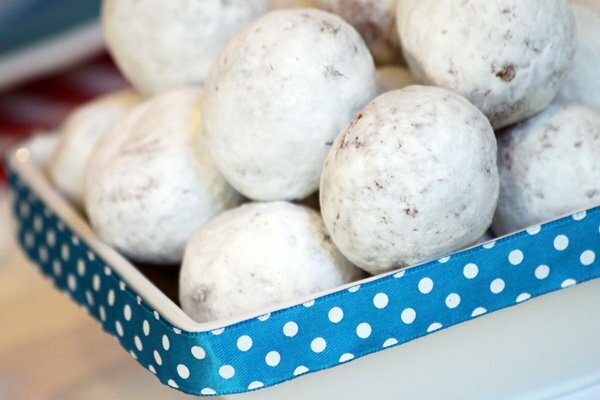 I placed them on wax paper to dry and crushed some peppermint on top for decoration. 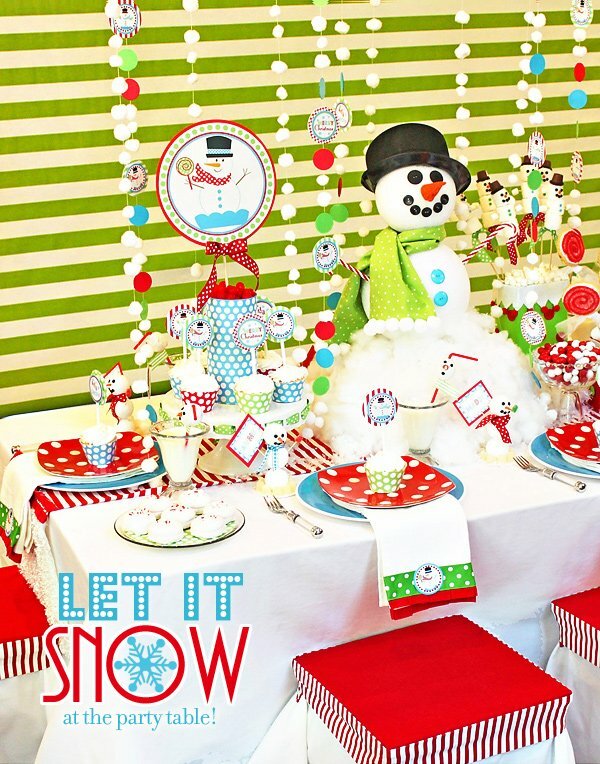 I made the table runner from red & white stripe fabric, fuzzy white fabric, and a ruffled red ribbon. I also sewed the stool covers (using a red napkin to add color to the top) and made the red and white stripe fabric sashes. Oh my goodness…amazingly cute and perfect. 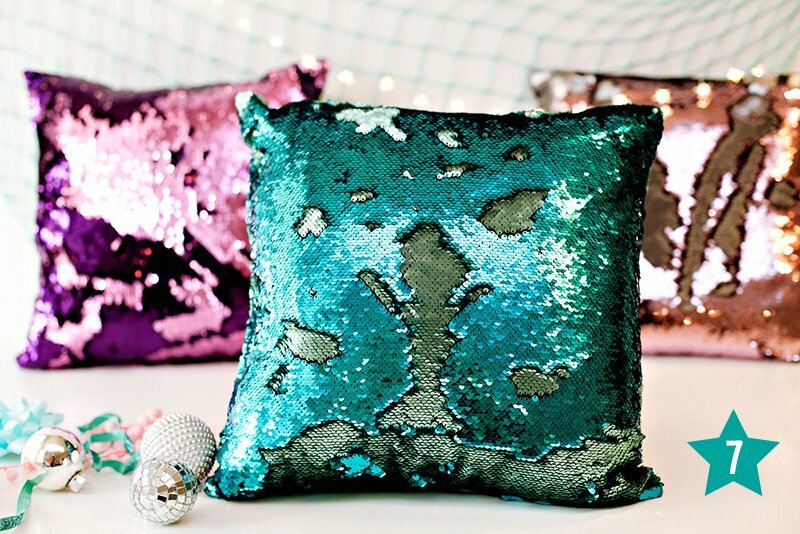 We’d love to get in some of this personalization! Everything Amanda does is stunning. 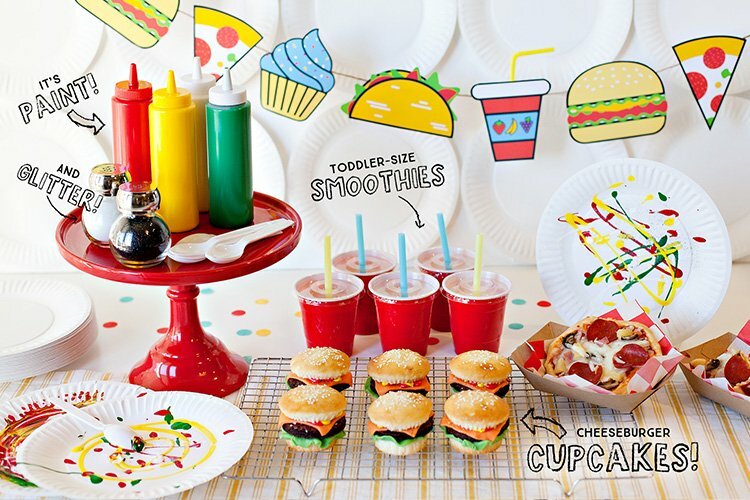 This is a kids Dream party! Ohhhhh, I’m so happy! I’ve been out all day working on a party for a little 6 year old boy and came in to find the feature on my snowman party! 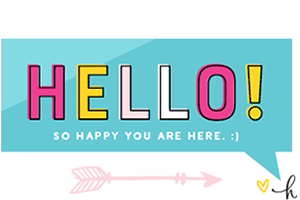 Thanks so much — you MADE my day!! 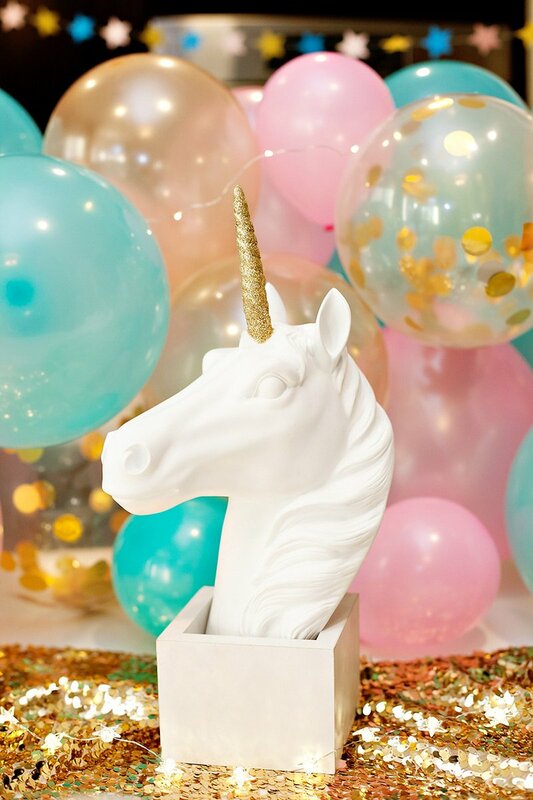 Oh my goodness, this party idea is too cute. 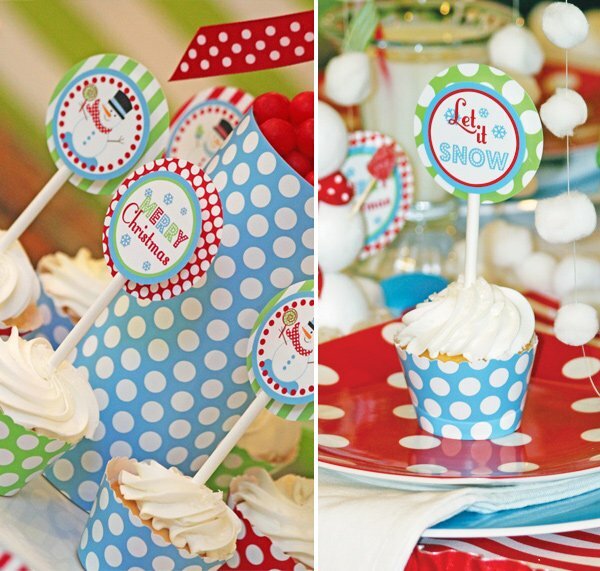 I think I am going to adapt it for a retirement party for a colleague who loves snowmen. Can you please tell me how you made the garland? Thanks for sharing this precious idea! 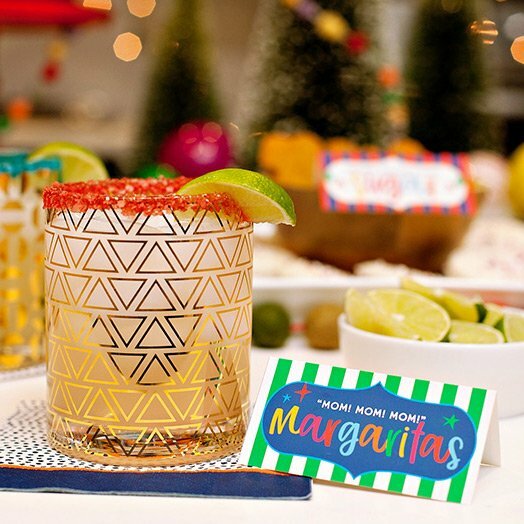 Such a cute party – I love what Miss Amanda puts out there – a true party gal!!!! So happy for her to be featured on HWTM!!!! Where did you find the giant styrofoam balls? 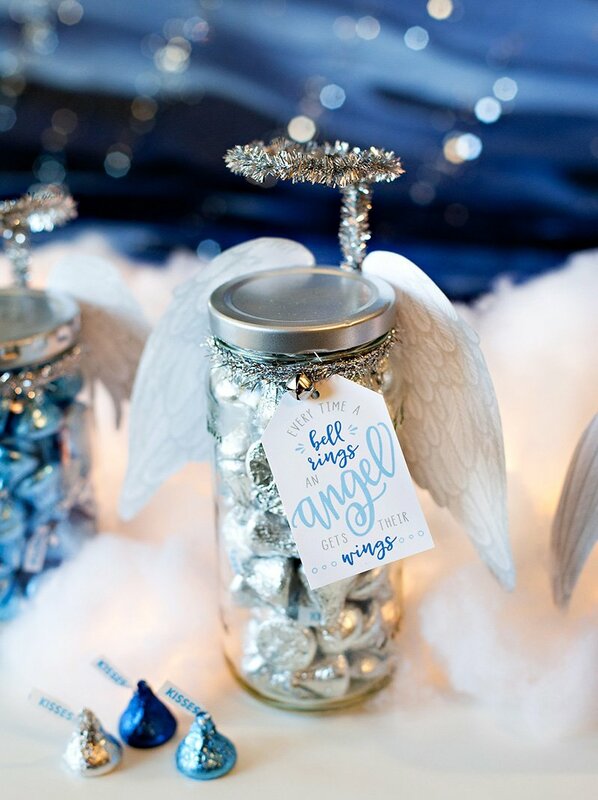 Melissa they have them at Hobby Lobby – make sure you have coupons – they are EXPENSIVE!